After having such a spectacular dinner at L'Atelier de Joël Robuchon, I could only wait three days before the urge to return became unbearable. Thus, my mom and I braved the gloomy overcast Taipei sky and misting rain on a Friday afternoon for lunch. We didn't have a reservation but we were promptly seated at the "bar." The concept of each L'Atelier is similar to that of a sushi bar but instead of watching a single sushi chef, those sitting at the bar are lucky enough to have a close-up view of the entire open kitchen. As we settled into our seats, I immediately noticed that Chef Yosuke Suga was in the kitchen that day. Not gonna lie, I was a little giddy. 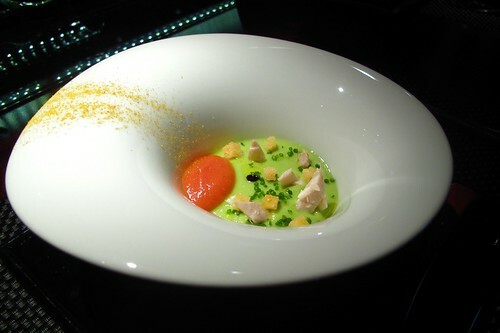 After nearly six years of working alongside Robuchon, Yosuke Suga opened the Toykyo outpost of L'Atelier de Joël Robuchon as Executive Chef in 2003. Then in 2006, Robuchon brought the 30-year-old Suga to the United States to open another L'Atelier in New York's Four Seasons Hotel. Robuchon obviously trusts this man to be at the helm of his newest endeavors. 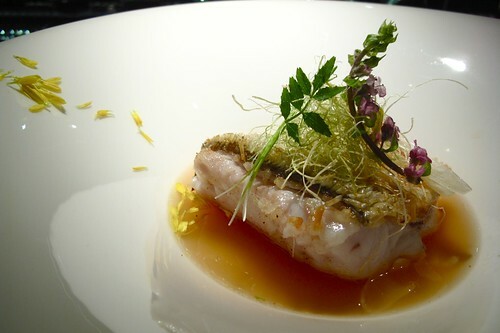 In 2009, as Robuchon began assembling some of his best staff to ensure a seamless opening for his newest venture in Taiwan, Suga was once again named the Executive Chef. If that is not impressive, I don't know what is. While Suga obviously has had extensive training in French cuisine, his dishes at L'Atelier are permeated with Japanese influences. All his dishes are elegant and complex yet understated, perhaps as a result of the interesting juxtaposition of French complexity and Japanese simplicity. 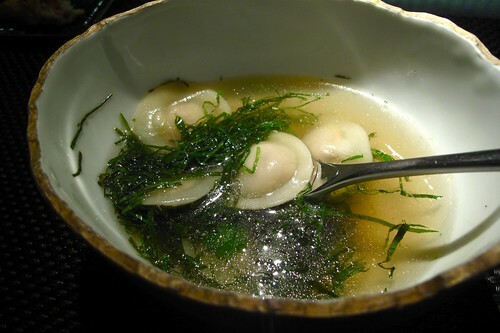 Suga is known for steering away from heavy combinations of meat and traditional French sauces--rich in butter and cream--and leaning towards the use of herbs and light broths. Thus, his dishes as light, yet retain an intricate layering of flavors--as evident in the dishes I had already had. I watched as he scrutinized and evaluated every dish before it was sent out. Everything he did was meticulous and methodical as he added finishing touches on dishes, spooned on generous amounts of caviar, and sliced wheels of imported french cheese. Under his watchful eye, his crew followed in the same precision as they each went about their jobs. It was amazing to watch the flurry of activity in the kitchen, yet feel the calm in the atmosphere. This was not organized chaos. This kitchen was just organized. You could tell that Chef Suga is very serious about his work, yet there was a certain charm to him. I overhead him asking what the people sitting next to us (some of his acquaintances) wanted for lunch and jokingly offering chou dou fu (Taiwanese stinky tofu) with a silly grin on his face. I don't think they got the joke but I was trying hard not to laugh. My mom and I chose to lunch on the Menu Club. 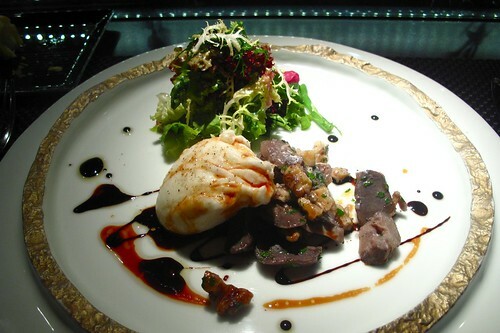 It consists of four courses with three different choices for each course. Of course, my mom and I chose something different for each course. Everything was just as spectacular. The same as the one we had at dinner and it was still just as good. 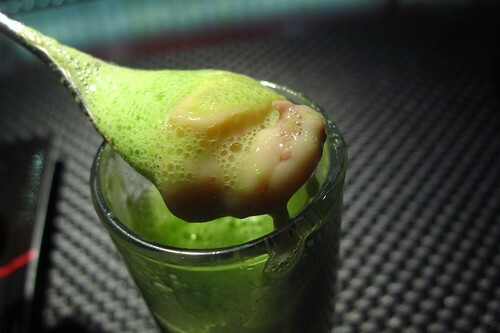 The pieces of chicken in the steamed egg custard are so tasty and I love the wasabi foam. 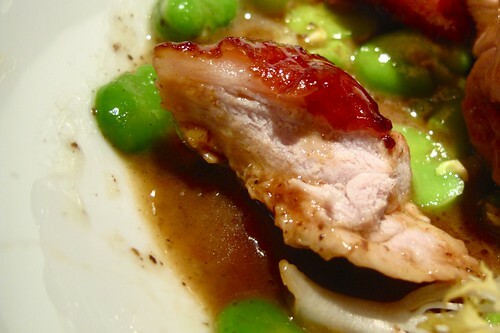 This dish is so beautifully plated it looks like a piece of abstract artwork. Underneath the vibrant green avocado cream dotted with pieces of tuna and crispy croutons is a layer of a creamy tuna salad like mixture. 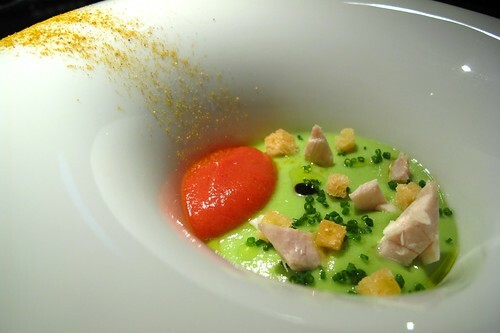 The bright red orange dollop of tomato puree on the side of the bowl not only provided a beautiful contrast in color but also a nice tart foil to the creamy avocado and tuna. I only got a bite of this but the bite I had was pretty damn good. Gizzards are one of my favorite offals, only coming second to tripe. 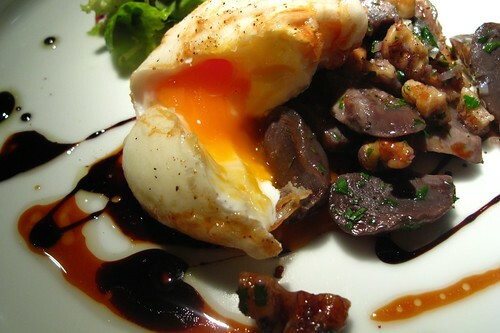 This salad of nice chewy duck gizzard, topped with a perfectly fried egg could not be more perfect for me. The rich runny yolk of the egg mixed with the tart vinaigrette and sweet crunchy walnuts complemented the savory gizzards so well. I loved it although the generous size of it made me a little too full. I have been wanting to try this dish for the longest time--they serve it at other L'Ateliers--and it definitely lived up to my expectations. 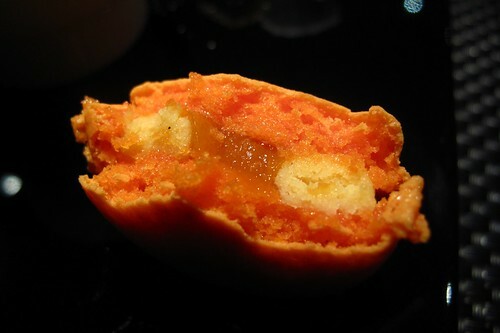 The little raviolis burst into the distinct creamy flavor of foie gras upon the first bite. 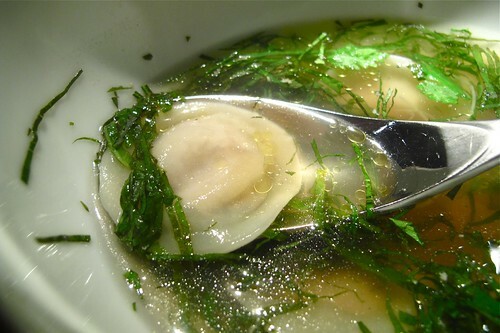 The light broth was topped with a fragrant combination of fresh herbs that I think included a chiffonade of shiso leaves. In my opinion, it didn't even need the crème fraîche that came on the side. I must've had on some ridiculous face of pure enjoyment because my mom told me to compose myself--the kitchen staff was looking. 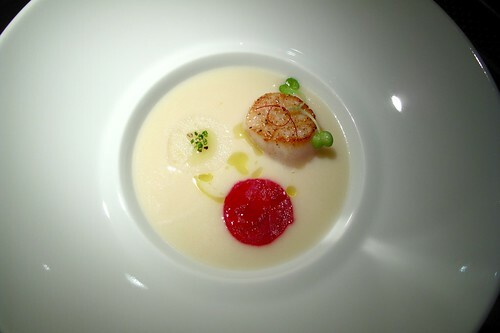 The creamy velouté had a wonderful hint of butter that complemented the sweet scallop. The drizzle of extra virgin olive oil added a delicate fruity layer. The scallop was perfection. 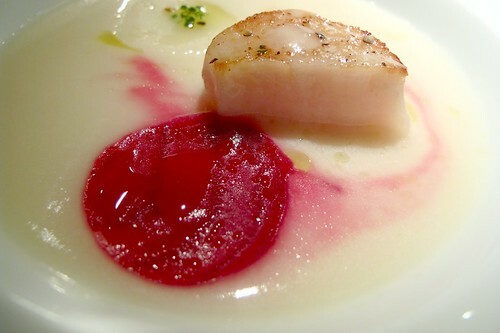 SO sweet and tender and so lightly seared that it was nearly raw, it was the best piece of scallop I'd ever had. I'm lucky my mom loves me and saved half of it for me. I don't know if I would've had the self-control to not eat the entire thing once I had a bite of it. Another beautiful plate. The scales were left on the skin of the fish but it was fried to a crisp so that the entire thing was edible. 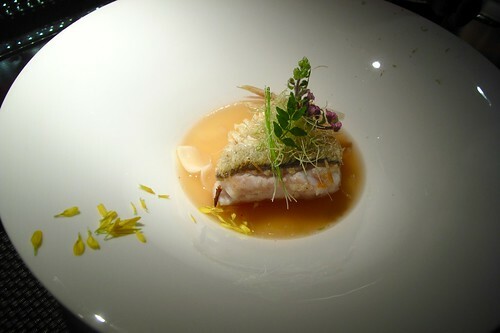 The white flesh of the fish was so tender and flaky, and the yuzu broth was so light, I should've stolen a few more bites. At dinner a few nights before, I noticed an entire suckling pig roasting in the kitchen. It was actually quite a sight and I'm sorry I didn't take a picture of it. We had asked the waiter what dish it was for and I had resolved to try it next time. This was the dish. It was sublime. The meat was so tender and so flavorful from the roasted fat of the pig drizzling back onto itself on the spinning rotisserie. The skin was perfectly crispy...nothing's better than crispy pork skin. 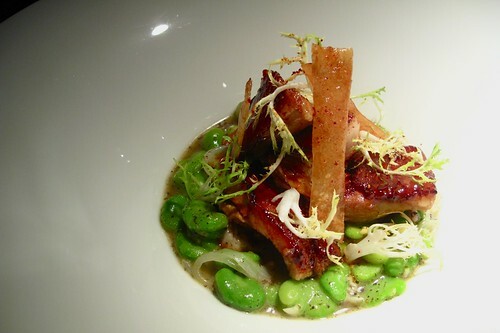 And the fava beans were so buttery and sweet. Just thinking about it is kind of making me drool. It was SO GOOD. The chocolate mousse was so creamy and just chocolatey. It was pure decadence. 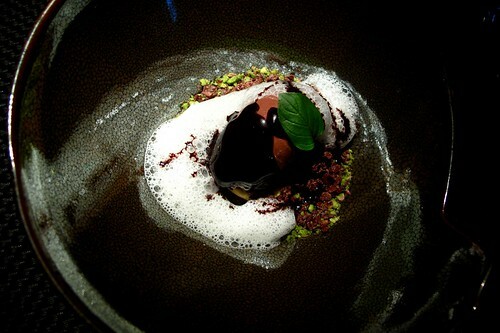 The pistachio and chocolate crumbles underneath added a nice layer of textures and the milk foam tempered the richness a little bit. 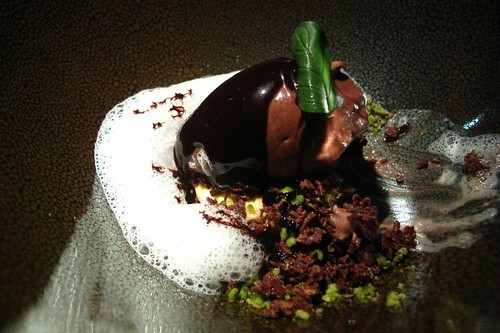 It's the perfect dessert for chocolate lovers. I rarely order île flottantes. I don't usually like foamy meringues floating on a some sea of liquid. 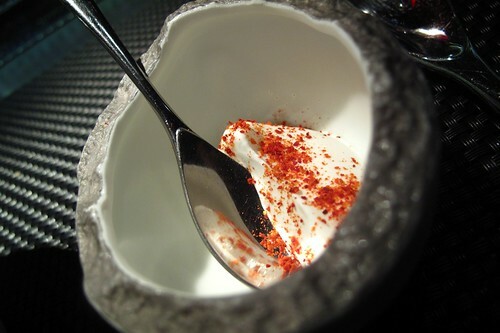 However, I was at L'Atelier de Joël Robuchon. I knew I'd be getting something far from a boring pile of meringue. I was right. This dessert was amazing. The meringue was baked so that the outside was crunchy and the inside still light and fluffy. 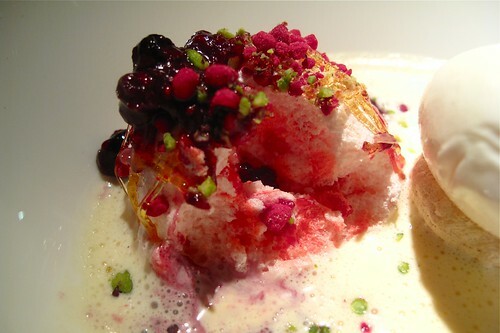 It was topped with a deliciously tart red berry sauce and a crunchy cooked sugar drizzle. The milk ice cream and light creme anglaise were also a great complements. 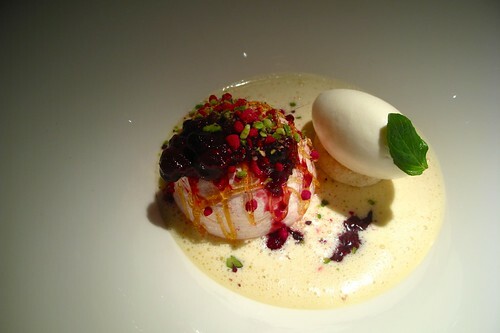 Overall, it was just a delightful dessert and a great fruity way to end a meal. 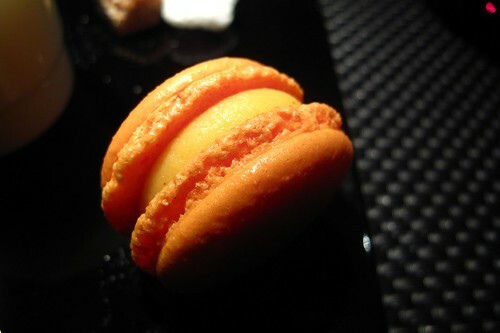 The macaron of the day was mango. I love mangos. I love macarons. Before we left, I asked for a signed copy of the menu. We also got to have a little conversation with Chef Suga himself. He asked me where I was from. I said that I go to school at UCLA, and then he said something wonderful. He said he'll be visting soon...he wants to open his own restaurant in LA. Please, please, please let that be true! LA would be lucky to have a chef as talented as him. Then, in true Japanese fashion, he walked us out the restaurant and to the elevators so that as the elevator door was closing, I was left with the image of Chef Suga and the wonderful meals I had in Taipei's L'Atelier. 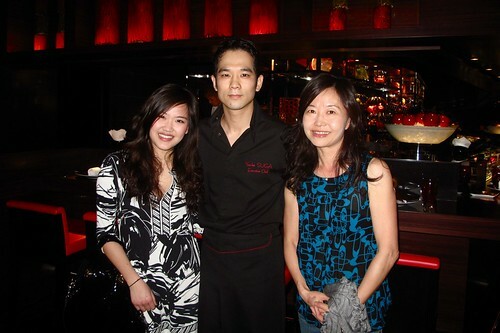 Pretty cool Taiwan finally has a Michelin caliber restaurant! That meal looks incredible! Beautiful photos too. I've been to the L'Atelier in Tokyo's Roppongi Hills, and it was definitely a memorable (and surprisingly well-priced) meal. Also... "my mom told me to compose myself--the kitchen staff was looking."